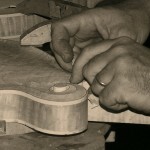 A LUTHIER is someone who repairs or builds stringed instruments. My wife has an old Scottish expression she uses when some one’s sanity is in doubt. “Ohhh, he’s not right”. It implies that he or she is a brick short of load, not a full loaf or as they say in Australia “not the full quid”. It’s an expression that can be applied en mass to mandolin players. They’re all a little crazy. When John Reischmann walked onto Kimberley’s Centre 64 stage some eight or so years ago he was carrying a vintage Gibson Lloyd Loar mandolin valued, at that time, at $70,000. Last year at the Idelwild Festival John walked onto the out door stage in Cranbrook carrying that same mandolin now valued at around $200,000. To pay that much for a small, delicate, easily stolen, easily damaged mandolin implies that the purchaser is seriously over funded or at least a little crazy. We all know that musicians, particularly in a marginal music genre such as Blue Grass, do not fall into the over funded class. They fall into the “ohh, he’s not right” class. Why so much money for a mandolin? It has a lot to do with supply and demand. The flat-backed Florentine (F5) style Mandolin is a North American adaptation; one would say re-invention, of the old style round-back European mandolin. This re-invention took place in Gibson Factory in the USA in the early part of the twentieth century and the man responsible was Lloyd Loar. His design ideas, based on his experiences with building violins, changed the whole concept of the building of mandolins and guitars. Lloyd Loar only worked for Gibson for five years and died in 1943. It is believed that only 326 Lloyd Loar signed mandolins were built. 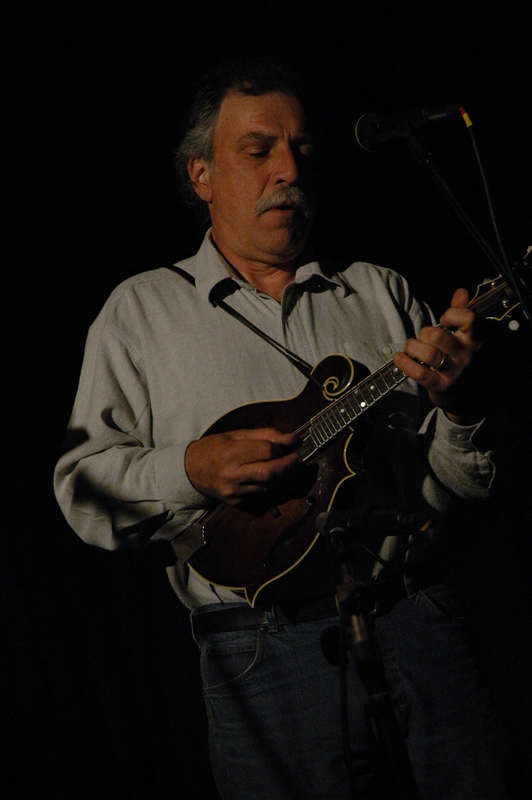 For most of his career the Blue Grass pioneer Bill Munroe played a Lloyd Loar mandolin. He virtually created a demand for the Gibson F5 mandolin as the instrument of choice. Hence the law of supply and demand has kicked in and the price of any existing authenticated Lloyd Loar mandolin has skyrocketed. It has also created a golden age of luthiery in North America. There are now probably more craftsmen engaged in the building of hand made instruments on this continent than any other time in North American history. This is despite the contracting out of most mass production to cheap overseas factories. Low end to medium price instruments are the prerogative of the overseas builders but the high end, fine detailed, precision instruments are still being built in North America. There are literally thousands of luthiers out there building these instruments. 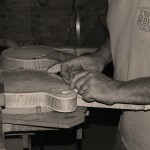 One of the finest luthiers on the planet is Michael Heiden who now resides in Creston. Michael has only recently relocated from Vancouver to Creston. The journey from the lower mainland to rural Creston, from high school student to master luthier, has taken place over 30 years and across at least two Canadian provinces. Music appears to have been part of the fabric of most of his life. There were the early obligatory pre-teen piano lessons and the experimentations with guitars that led, not down the usual road of rock & roll “guitar god” infatuations but rather straight into the country blues of Dave Van Ronk and Mississippi John Hurt. This was out of step with his school chums of the time but certainly in keeping with the mid-1960’s international groundswell of interest in finger picking guitar music. After leaving high school in 1972 he moved in with a commune of instrument builders on Galiano Island. It was partly a life style choice but also an opportunity to learn how to build guitars, harps, and dulcimers. This was the heyday of “Pied Pumpkin” and their particular brand of dulcimer inspired music. There was a big demand for the instrument and this demand created opportunities for a whole cadre of novice builders. A brief sojourn in a Slocan sawmill and the experience of living around Nelson in the hippie heyday of the 1970’s nurtured an interest in the “old-timey” music of Doc Watson and Bob Wills. On returning to Vancouver he became an active professional musician playing in a Django Rheinhardt (French Gypsy) style jazz group with Michael Dunn, a luthier who is responsible for training a whole generation of BC instrument builders. While continuing his professional performing career Michael Heiden was doing repairs and doing a little building on the side. 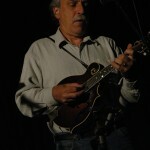 Michael’s first brush with live Blue Grass and the music of Bill Monroe came at the Carlyle Blue Grass Festival in 1974. He started building A-style flat back mandolins but the construction of the sculptured Florentine (F) style instrument appeared to be an insurmountable challenge. In 1981 he moved to Calgary and became part of the very active acoustic music scene in that city. He played in many bands, toured a lot, did instrument repairs and continued to do some building on the side. 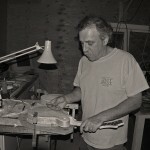 By trial and error he mastered the complexity of building the F-style mandolin. For over 30 years Calgary has had four fully subscribed, jam packed Folk Clubs and every weekend was, and is, a hot bed of acoustic music. The repair building and the touring became so intense that his real passion for building was being pushed to the side. As his reputation as a luthier grew it became harder to juggle all his commitments. In order to re-invent himself, diverse himself of the repair business and take care of some family commitments he moved back to Vancouver in 1991. He stopped touring in 1996, moved to Chilliwack and, in his words, “to build instruments and grow tomatoes”. Michael Heiden is one of number of mandolin builders riding the crest of a new golden age of luthiery. While the overseas builders have capture a large section of the market they have not yet figured out the F-Style mandolin and the demand for hand-built quality instruments appears assured. At a certain stage in a mandolin player’s technical development there is the almost irresistible urge to feel, hear and play an especially fine instrument. 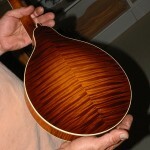 This is despite the going price for a hand built mandolin at around $8,000 to $20,000 (depending on the builder). After all, compared to a $200,000 vintage Lloyd Loar they are a bargain. By October last year he felt it was time to leave the lower mainland circus behind and move to Creston. He likes the rural lifestyle and he has longtime musical friends living in the area. To give himself the space and comfort he requires he is constructing a new workshop. This will enable him to get back into building flat-top and arch-top guitars as well as his much loved F-style Mandolins, Mandolas and Mandocellos. And, apart from that, he plans to enjoy playing music with his old time friends and, more than maybe, grow a few tomatoes.